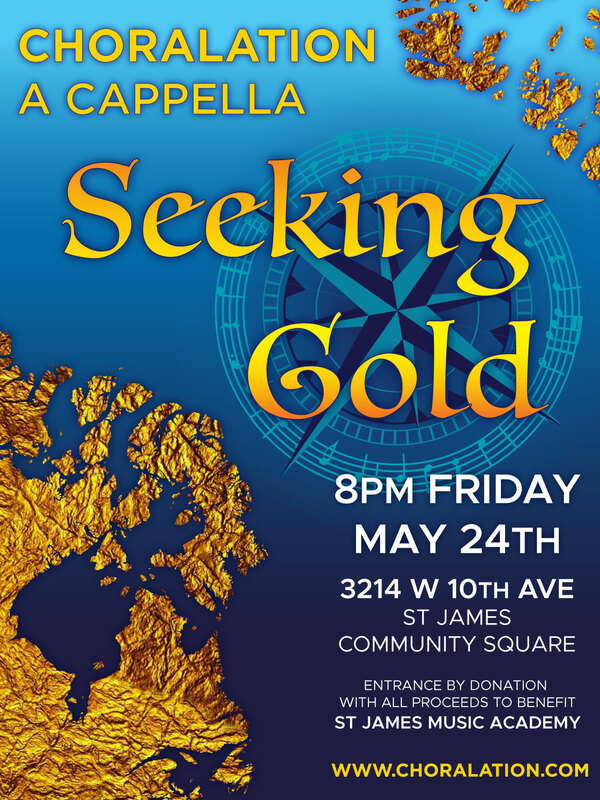 From the wonders of the Arabian deserts to the beautiful barren landscapes of Canada's far north, Seeking Gold brings to you a collection of a cappella treasures sure to delight. Choralation is returning this year to participate in Vancouver's Yule Duel event on December 6th, 2018 in Gastown. Choralation will be preparing some great Christmas a cappella arrangements this year; be sure to come check us out! Yule Duel is an annual fundraising event where choirs of all types join together to bring Christmas music to the streets of Downtown Vancouver in order raise funds for May’s Place Hospice, a registered charity which provides care and compassion to vulnerable and marginalized people in the Downtown Eastside. Thank you so much to all who supported us last year by making donations to May's Place and to those who came out to the event. With your help we raised over $1000 for this great charity. We're hoping to break that goal this year! Please consider donating to this amazing cause! Join Choralation as we celebrate our 10th anniversary! With a program of old favourites such as Rise Up My Love from Canadian composer Healey Willan and the beautiful Hide and Seek by Imogen Heap, as well as a handful of new selections, our concert is sure to bring our best to you! 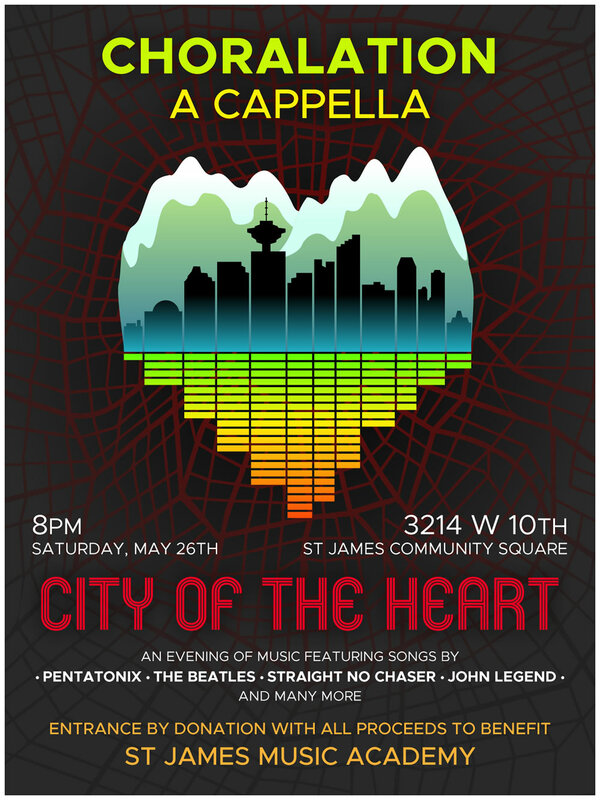 Now in our tenth year, Choralation A Cappella invites you to "City of the Heart". This year, for the first time ever, Choralation A Cappella will be participating in Vancouver's Yule Duel event on December 7th, 2017 in Gastown. Choralation will be singing a selection of a cappella arrangements of your favourite holiday songs on this special night. For more information about Yule Duel 2017 and to sponsor Choralation, please visit our Yule Duel Page. Come in from the wind and rain for an afternoon of wonderful repertoire from Choralation A Cappella. 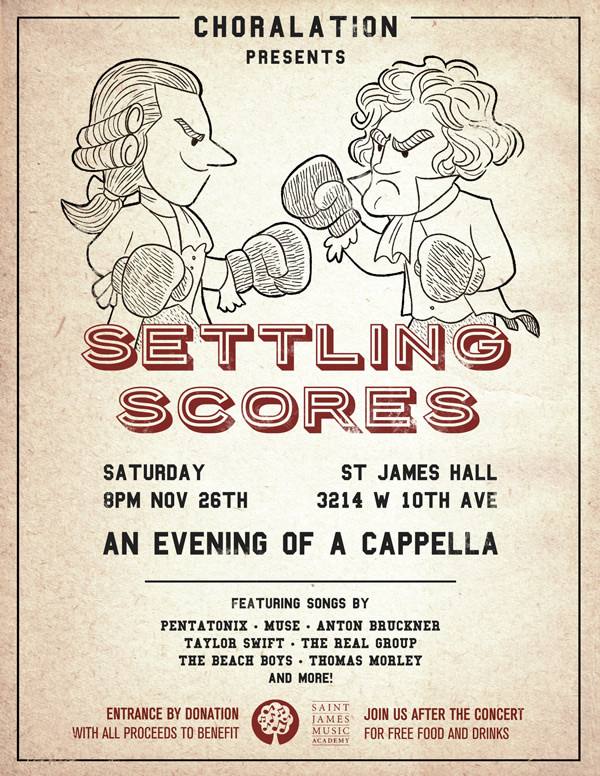 Featuring songs by Pentatonix, Toto, Stan Rogers, Gustav Holst, and many more, our fall concert is sure to warm your spirits. 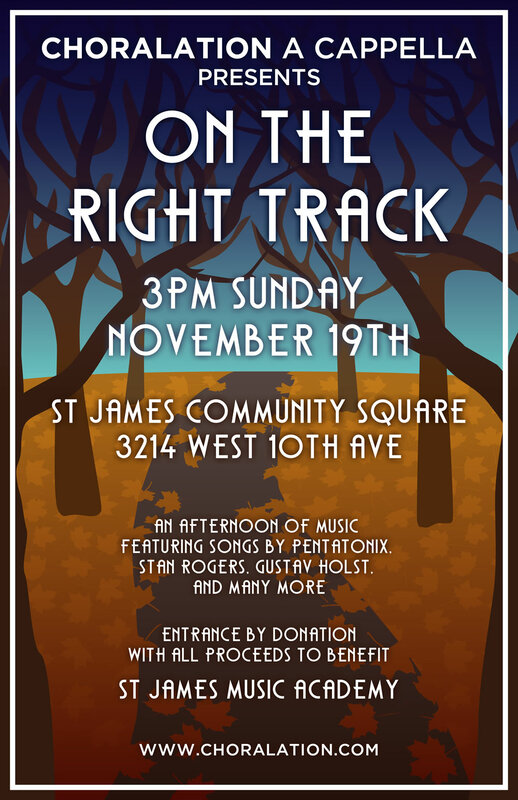 Thanks to your generous donations, "On the Right Track" raised $600 for local Vancouver charity St James Music Academy. We hope you enjoyed the show and we can't wait to see you at our next concert! This year's "Evening of A Cappella" raised over $650 for St James Music Academy, thanks to one of our biggest audiences yet! Thank you to all who came out to support us and this amazing local charity. Choralation's annual full-length concert returned for the seventh year. This time our a cappella programme included selections from The Real Group, Pentatonix, Taylor Swift, and Muse. Our biggest audience ever made this event a huge success. Choralation raised $750 for St James Music Academy and we had a fantastic night. Choralation stepped out on the town to perform four of our favourite songs at Corduroy's Open Mic night. We shared the evening with several talented musicians including the amazing Calum Graham on guitar. Choralation's annual full-length concert returned for the sixth year. This time our a cappella programme included selections from The Real Group, Simon and Garfunkel, Leonard Cohen, and Wade Hemsworth. Thank you to all who helped make this concert such a success once again! Choralation presents a short selection of our a cappella repertoire for you to enjoy with a delicious cup of coffee at this friendly, acoustically appealing neighbourhood cafe. Choralation's annual full-length concert returned for a fifth year, sharing with our audience a selection of repertoire ranging from jazz to classical, folk to pop. Thank you to all who attended and helped us raise over $300 for St James Music Academy. Choralation returned for a fifth year to Make Music Vancouver to perform on the streets of Vancouver as part of this annual free event celebrating the longest day of the year. Thanks to all who came out to enjoy the music of Vancouver! Choralation returned to Kitsilano for our fourth annual full-length summer concert. We presented an evening of selected repertoire including The Beatles, Billy Joel, Josquin Des Prez, Stevie Wonder, and many more. Choralation's third annual performance as part of Make Music Vancouver took place this year in Yaletown, behind the Skytrain station at the corner of Mainland and Davie. Thank you for joining us to celebrate the longest day of the year with selections from our 2013 repertoire. Choralation's annual full-length summer concert returned for a third year! Our concert featured an evening of selected repertoire including Stan Rogers, The Beatles, Anton Bruckner, Michael Jackson, and many more. Choralation returned for a second year to participate in Vancouver's festival of free music in the heart of downtown. Choralation performed as part of UBC's Annual Physics and Astronomy Music Night. Our holiday repertoire selections were enjoyed by visitors to the Gardens' beautiful display of festive lighting. Choralation's second annual Evening of A Cappella was held at St. James Community Square, located in Kitsilano at 3214 West 10th Avenue, Vancouver, BC. Choralation gave a free performance as part of the Make Music Vancouver event in historic Gastown. Thank you to everyone, audience members and performers alike, who made this festival such a success. Choralation returned for a third year to contribute a selection of songs to the UBC PHAS Music Night. 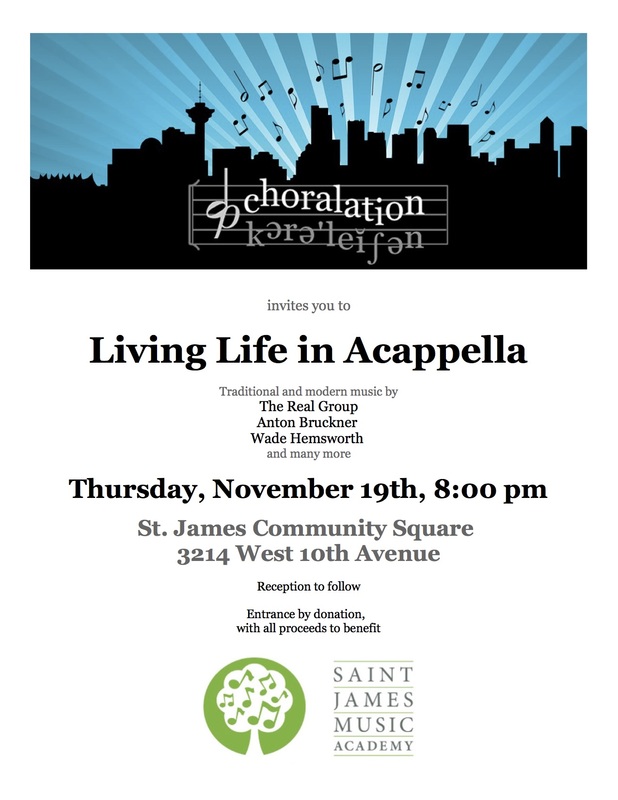 Choralation's first annual full-length concert: we presented an evening of music in support of Arts Umbrella. Thank you to everyone who helped make this evening such a success! Choralation performed a selection from this season's repertoire. Choralation presented a selection of repertoire from our 2010 season. Choralation returned for a second year to the UBC Annual PHAS Music Night. Choralation performed a selection of our repertoire including some of our Christmas favourites. 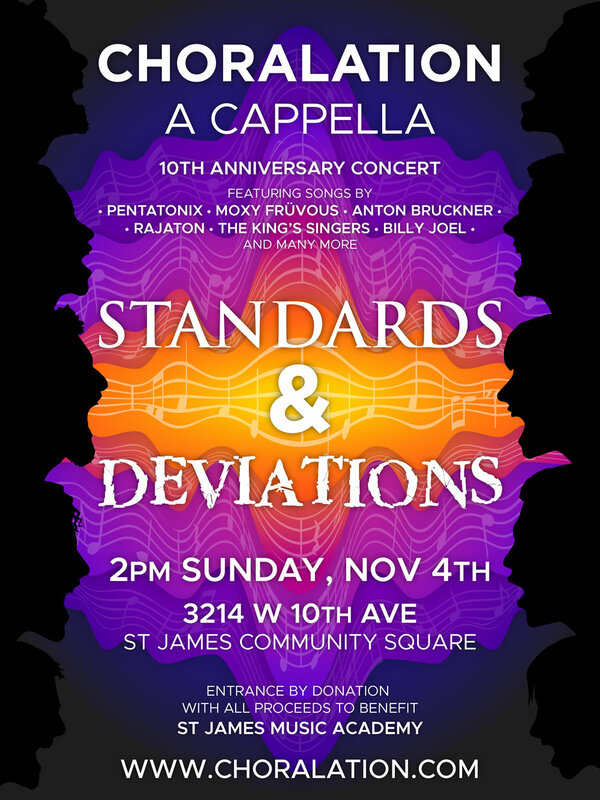 Unitarian Church, 949 W. 49th Ave at Oak St.
Choralation presented a selection of a cappella repertoire. Choralation offered selections from our repertoire as part of UBC's Annual PHAS 'Talent Show'.